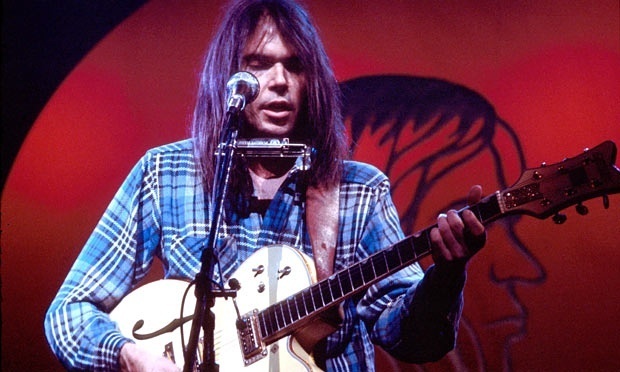 Neil Young caught polio in Canada the same year as Joni Mitchell. The authorities placed those with the condition in isolation with chains across the door. This is reflected in his standard Helpless https://youtu.be/qOv9nwuC67Y?t=89 . 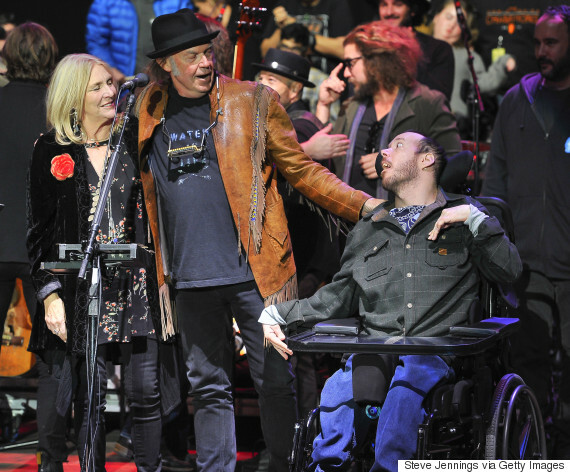 Joni demonstrated solidarity with disabled people on Turbulent Indigo, showing herself as Vincent Van Gogh. She sung Helpless with Neil in the film the ‘Last Waltz’. Young also had epilepsy which he claimed contributed to his music. “ There is a town in North Ontario. With dream comfort memory to spare. And in my mind I still need a place to go. Blue. Blue windows behind the stars. Big birds flying across the sky. Babe, can you hear me now? 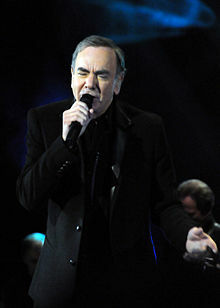 Neil Leslie Diamond (born January 24, 1941) is an American singer-songwriter, musician and actor. With 38 songs in the Top 10 on the BillboardAdult Contemporary charts, Diamond has sold more than 100 million records worldwide, making him one of the best-selling musicians of all time. On the Hot 100 and Adult Contemporary charts, he has had ten No. 1 singles: “Cracklin’ Rosie”, “Song Sung Blue”, “Longfellow Serenade”, “I’ve Been This Way Before”, “If You Know What I Mean”, “Desiree”, “You Don’t Bring Me Flowers”, “America”, “Yesterday’s Songs”, and “Heartlight”. Diamond was born in Brooklyn, New York, to a Jewish family descended from Russian and Polish immigrants. His parents were Rose (née Rapoport) and Akeeba “Kieve” Diamond, a dry-goods merchant. He grew up in several homes in Brooklyn, having also spent four years in Cheyenne, Wyoming, where his father was stationed in the army. In Brooklyn he attended Erasmus Hall High School[ and was a member of the Freshman Chorus and Choral Club, along with classmate Barbra Streisand; Diamond recalled they were not close friends at the time: “We were two poor kids in Brooklyn. We hung out in the front of Erasmus High and smoked cigarettes.” After his family moved, he then attended Abraham Lincoln High School,and was a member of the fencing team. Also on the team was his best friend, future Olympic fencer Herb Cohen. Diamond also used his newly developing skill to write poetry. By writing poems for girls he was attracted to in school, he soon learned it often won their hearts. His male classmates took note and began asking him to write poems for them which they would sing and use with equal success. He spent the summer following his graduation as a waiter in the Catskills resort area. There he first met Jaye Posner, who would years later become his wife. Diamond next attended New York University as a pre-med major on a fencing scholarship, again on the fencing team with Herb Cohen. He was a member of the 1960 NCAA men’s championship fencing team. Often bored in class, he found writing song lyrics more to his liking. He began cutting classes and taking the train up to Tin Pan Alley, where he tried to get some of his songs heard by local music publishers. In his senior year, when he was just 10 units short of graduation, Sunbeam Music Publishing offered him a 16-week job writing songs for $50 a week (equivalent to about US$405 per week, in 2017 dollars), and he dropped out of college to accept it. Diamond’s first recording contract was billed as “Neil and Jack”, an Everly Brothers-type duo comprising Diamond and high school friend Jack Packer. They recorded two unsuccessful singles: “You Are My Love at Last” b/w “What Will I Do” and “I’m Afraid” b/w “Till You’ve Tried Love”, both released in 1962. Cashbox and Billboard magazines gave all four sides excellent reviews. Later in 1962, Diamond signed with Columbia Records as a solo performer. In July 1963 Columbia released the single “At Night” b/w “Clown Town”, which Billboard gave an excellent review to Clown Town and Cashbox gave both sides excellent reviews, but it still failed to chart. Columbia dropped him from their label and he went back to writing songs in and out of publishing houses for the next seven years. He wrote wherever he could, including on buses, and used an upright piano above the Birdland Club in New York City. One of the causes of this early nomadic life as a songwriter was his songs’ wordiness: “I’d spent a lot of time on lyrics, and they were looking for hooks, and I didn’t really understand the nature of that,” he says. It wasn’t until years later, when I went into Freudian analysis, that I understood that it was me. It was an outgrowth of my despair. Diamond spent his early career as a songwriter in the Brill Building. His first success as a songwriter came in November 1965, with “Sunday and Me”, a Top 20 hit for Jay and the Americans. Greater success followed with “I’m a Believer”, “A Little Bit Me, a Little Bit You”, “Look Out (Here Comes Tomorrow)”, and “Love to Love”, all performed by the Monkees. Diamond wrote and recorded the songs for himself, but the cover versions were released before his own. The unintended, but happy, consequence was that Diamond began to gain fame not only as a singer and performer, but also as a songwriter. “I’m a Believer” became a gold record within two days of its release, and stayed at the top of the charts for seven weeks, making it the Popular Music Song of the Year in 1966. “And the Grass Won’t Pay No Mind” brought covers from Elvis Presley (who also interpreted “Sweet Caroline”) and Mark Lindsay, former lead singer for Paul Revere & the Raiders. Other notable artists who recorded his early songs were the English hard-rock band Deep Purple, Lulu, and Cliff Richard. In 1966, Diamond signed a deal with Bert Berns’s Bang Records, then a subsidiary of Atlantic. His first release on that label, “Solitary Man”, became his first true hit as a solo artist. [d] Diamond later followed with “Cherry, Cherry” and “Kentucky Woman”. His early concerts saw him as a “special guest” of, or opening for, everyone from Herman’s Hermits to, on one occasion, the Who. As a guest performer with The Who, he was shocked to see Pete Townshend swinging his guitar like a club and then throwing it against walls and off the stage until the instrument’s neck broke. It was the first time he had seen a band smashing their instruments and amplifiers to pieces. Diamond began to feel restricted by Bang Records, because he wanted to record more ambitious, introspective music, like his autobiographical “Brooklyn Roads” from 1968. Berns wanted to release “Kentucky Woman” as a single, but Diamond was no longer satisfied writing simple pop songs, so he proposed “Shilo”, which was not about the Civil War but rather an imaginary childhood friend. Bang believed that the song wasn’t commercial enough, so it was relegated to being an LP track on “Just for You”. In addition to being dissatisfied with his royalties, Diamond tried to sign with another record label after discovering a loophole in his contract that did not bind him exclusively to either WEB IV or Tallyrand, but the result was a series of lawsuits that coincided with a slump in his record sales and professional success. A magistrate refused WEB IV’s request for a temporary injunction to prevent Diamond from joining another record company while his contract dispute continued in court, but the lawsuits persisted until February 18, 1977, when he triumphed in court and purchased the rights to his Bang-era master tapes. In late 1969, he moved to Los Angeles. After “Brother Love’s Travelling Salvation Show” in February 1969, his sound mellowed, with such songs as “Sweet Caroline” (1969), “Holly Holy” (1969), “Cracklin’ Rosie” (1970) and “Song Sung Blue” (1972), the last two reaching No. 1 on the Hot 100. “Sweet Caroline” was Diamond’s first major hit after his slump. In 2007 Diamond said he had written “Sweet Caroline” for Caroline Kennedy after seeing her on the cover of Life in an equestrian riding outfit, but in 2014, he said in an interview on the Today Show that it was written for his then wife, Marcia. He could not find a good rhyme with the name “Marcia”, and so used the name Caroline. It took him just one hour, in a Memphis hotel, to write and compose it. The 1971 release “I Am…I Said” was a Top 5 hit in both the US and UK and was his most intensely personal effort to date, taking over four months to complete. In 1971, Diamond played 7 sold-out concerts at the Greek Theater in Los Angeles. The outdoor theater, which was noted for showcasing the best of current entertainers, added a stereo sound system for the first time. Diamond was also backed by a 35-piece string orchestra and six backing singersAfter the first night, one leading newspaper called it “the finest concert in Greek Theater history. I have a love-hate relationship with songwriting. I love it because it’s so satisfying…when it works. I hate it because it forces you to dig inside yourself. It is without question the most difficult thing I do. The performance of August 24, 1972, was recorded and released as the live double album Hot August Night. Hot August Night demonstrates Diamond’s skills as a performer and showman, as he reinvigorated his back catalogue of hits with new energy. 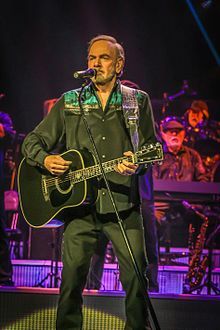 Many consider it his best work; critic Stephen Thomas Erlewine called Hot August Night “the ultimate Neil Diamond record… [which] shows Diamond the icon in full glory.” The album became a classic, and was remastered in 2000 with additional selections. In Australia, which at the time had the most Neil Diamond fans per capita of any country, the album ranked No. 1 for 29 weeks and stayed in their top 20 bestsellers for two years. 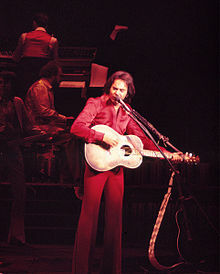 Neil Diamond’s one-man show seemed, on the face of it, to be a brash idea. One-man shows have traditionally been associated with talents like Judy Garland and Danny Kaye. But Mr. Diamond is clearly a brash young man and one with both the musical track record and the performance macho to bring it off…He needn’t worry about comparisons with the likes of Garland and Kaye. After the Winter Garden shows, Diamond announced that he needed a break, and he engaged in no more live performances till 1976. He used those four years to work on the score for Hall Bartlett’s film version of Richard Bach’s Jonathan Livingston Seagull and to record two albums, Serenade and Beautiful Noise. He said years later, “I knew I’d come back, but I wasn’t sure when. I spent one year on each of those albums…I’d been on the road six years. I had a son 2½ and I felt he needed me more than the audience did. So for four years I devoted myself to my son Jesse.” He also said he needed to get back to having a private life, one where he could be anonymous. In 1973, Diamond switched labels again, returning to Columbia Records for a million-dollar-advance-per-album contract (US$5,512,744 in 2017 dollars) His first project, released as a solo album, was the soundtrack to Jonathan Livingston Seagull. The film received hostile reviews and did poorly at the box office, and the album grossed more than the film did. Richard D. Bach, author of the best-selling source story, disowned the film, and he and Diamond sued Bartlett, though for differing reasons; in Bach’s case, it was because he felt the film omitted too much from the original novella, whereas in Diamond’s case, it was because he felt the film had butchered his score. “After ‘Jonathan,'” Diamond declared, “I vowed never to get involved in a movie again unless I had complete control.” Bartlett angrily responded to Diamond’s lawsuit by criticizing his music as having become “too slick…and it’s not as much from his heart as it used to be.” Bartlett also added, “Neil is extraordinarily talented. Often his arrogance is just a cover for the lonely and insecure person underneath. Despite the controversy surrounding the film, the soundtrack was a success, peaking at No. 2 on the Billboard albums chart. Diamond also won a Golden Globe Award for Best Original Score and a Grammy Award for Best Score Soundtrack Album for a Motion Picture. Thereafter, Diamond often included a Jonathan Livingston Seagull suite in his live performances, as he did in his 1976 “Love at the Greek” concert and for his show in Las Vegas that same year. Diamond returned to live shows in 1976 with an Australian tour, “The ‘Thank You Australia’ Concert”, which was broadcast to 36 television outlets nationwide. He also again appeared at the Greek Theater in a 1976 concert, Love at the Greek. An album and accompanying video/DVD of the show includes a version of “Song Sung Blue” with duets with Helen Reddy and Henry Winkler, a.k.a. Arthur “The Fonz” Fonzarelli of Happy Days. In 1974, Diamond released the album Serenade, from which “Longfellow Serenade” and “I’ve Been This Way Before” were issued as singles. The latter had been intended for the Jonathan Livingston Seagull score, but Diamond had completed it too late for inclusion. That same year he appeared on a TV special for Shirley Bassey and sang a duet with her. In 1976, he released Beautiful Noise, produced by Robbie Robertson of The Band. On Thanksgiving 1976, Diamond made an appearance at The Band’s farewell concert, The Last Waltz, performing “Dry Your Eyes”, which he wrote jointly with Robertson, and which had appeared on Beautiful Noise. 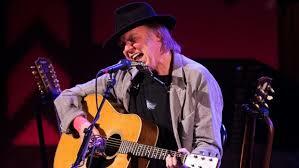 He also joined the rest of the performers onstage at the end in a rendition of Bob Dylan’s “I Shall Be Released”. In 1977, Diamond released I’m Glad You’re Here With Me Tonight, including “You Don’t Bring Me Flowers”, for which he composed the music and on the writing of whose lyrics he collaborated with Alan Bergman and Marilyn Bergman. Barbra Streisand covered the song on her album Songbird, and later, a Diamond-Streisand duet was recorded, spurred by the success of radio mash-ups. That version hit No. 1 in 1978, his third song to top the Hot 100. They appeared unannounced at the 1980 Grammy awards ceremony, where they performed the song to a surprised and rapturous audience. His last 1970s album was September Morn, which included a new version of “I’m a Believer”. It and “Red Red Wine” are his best-known original songs made more famous by other artists. In February 1979, the uptempo “Forever in Blue Jeans”, co-written and jointly composed with his guitarist, Richard Bennett, was released as a single from You Don’t Bring Me Flowers, Diamond’s album from the previous year. In 1979, Diamond collapsed on stage in San Francisco and was taken to the hospital, where he endured a 12-hour operation to remove what turned out to be a tumor on his spine. He said he had been losing feeling in his right leg “for a number of years but ignored it.” When he collapsed, he had no strength in either leg. He underwent a long rehabilitation process just before starting principal photography on his film The Jazz Singer (1980) He was so convinced he was going to die that he wrote farewell letters to his friends. A planned film version of “You Don’t Bring Me Flowers” to star Diamond and Streisand fell through when Diamond instead starred in a 1980 remake of the Al Jolson classic The Jazz Singeralongside Laurence Olivier and Lucie Arnaz. Though the movie received poor reviews, the soundtrack spawned three Top 10 singles, “Love on the Rocks”, “Hello Again”, and “America”, the last of which had emotional significance for Diamond. “‘America’ was the story of my grandparents,” he told an interviewer. “It’s my gift to them, and it’s very real for me … In a way, it speaks to the immigrant in all of us.” The song was performed in full by Diamond during the film’s finale. An abbreviated version played over the film’s opening titles. The song was also the one he was most proud of, partly because of when it was later used: national news shows played it when the hostages were shown returning home after the Iran hostage crisis ended; it was played on the air during the 100th anniversary of the Statue of Liberty; and at the tribute to Martin Luther King and the Vietnam Vets Welcome Home concert, he was asked to perform it live. At the time, a national poll found the song to be the number-one most recognized song about America, more than “God Bless America”. It also became the anthem of his world tour two weeks after the attacks on America on September 11, 2001, when he changed the lyric at the end from; “They’re coming to America”, to “Stand up for America!” Earlier that year he performed it after a request from former heavyweight champion Muhammad Ali. Another Top 10 selection, “Heartlight”, was inspired by the blockbuster 1982 movie E.T. The Extra-Terrestrial. Though the film’s title character is never mentioned in the lyrics, Universal Pictures, which had released E.T. The Extra-Terrestrial and was the parent company of the Uni Records label, by then called MCA Records, for which Diamond had recorded for years, briefly threatened legal action against both Diamond and Columbia Records. Diamond’s record sales slumped somewhat in the 1980s and 1990s, his last single to make the Billboard’s Pop Singles chart coming in 1986, but his concert tours continued to be big draws. Billboard magazine ranked Diamond as the most profitable solo performer of 1986. He released his 17th studio album in 1986, Headed for the Future, which reached number 20 on the Billboard 200. Three weeks later he starred in Hello Again, his first television special in nine years, performing comedy sketches and a duo medley with Carol Burnett. In January 1987, Diamond sang the national anthem at the Super Bowl. His “America” became the theme song for the Michael Dukakis 1988 presidential campaign. That same year, UB40’s reggae interpretation of Diamond’s ballad “Red Red Wine” topped the Billboard Pop Singles chart and, like the Monkees’ version of “I’m a Believer”, became better known than Diamond’s original version. During the 1990s, Diamond produced six studio albums. He covered many classic songs from the movies and from famous Brill Building-era songwriters. He also released two Christmas albums, the first of which peaked at No. 8 on Billboard’s Album chart. Diamond also recorded two albums of mostly new material during this period. In 1992, he performed for President George H.W. Bush’s final Christmas in Washington NBC special. In 1993, Diamond opened the Mark of the Quad Cities (now the iWireless Center) with two shows on May 27 and 28 to a crowd of 27,000-plus. The 1990s saw a resurgence in Diamond’s popularity. “Sweet Caroline” became a popular sing-along at sporting events. It was used at Boston College football and basketball games. College sporting events in other states also played it, and it was even played at sports events in other countries, such as a Hong Kong Sevens rugby tournament or a soccer match in Northern Ireland. It became the theme song of Red Sox Nation, the fans of the Boston Red Sox. The song also came to be played during the 8th inning of every New York Mets home game. The New York Rangers also adapted it as their own, and played it whenever they were winning at the end of the 3rd period of their games. The Pitt Panthers football team also played it after the third quarter of all home games, with the crowd cheering, “Let’s go Pitt”. The Carolina Panthers played it at the end of every home game they won. The Davidson College pep band likewise played it at every Davidson Wildcats men’s basketball home game, in the second half. On March 19, 2008, it was announced on the television show American Idol that Diamond would be a guest mentor to the remaining Idolcontestants, who would sing Diamond songs for the broadcasts of April 29 and 30, 2008. On the April 30 broadcast, Diamond premiered a new song, “Pretty Amazing Grace”, from his then recently released album Home Before Dark. On May 2, 2008, Sirius Satellite Radio started Neil Diamond Radio. On April 8, 2008, Diamond made a surprise announcement in a big-screen broadcast at Fenway Park that he would be appearing there “live in concert” on August 23, 2008, as part of his world tour. The announcement, which marked the first official confirmation of any 2008 concert dates in the US, came during the traditional eighth-inning singalong of “Sweet Caroline”, which had by that time become an anthem for Boston fans. On April 28, 2008, Diamond appeared on the roof of the Jimmy Kimmel building to sing “Sweet Caroline” after Kimmel was jokingly arrested for singing the song dressed as a Diamond impersonator. On June 29, 2008, Diamond played to an estimated 108,000 fans at the Glastonbury Festival in Somerset, England on the Concert of a Lifetime Tour; technical problems[which?] marred the concert. In August, Diamond allowed cameras to record his entire four-night run at New York’s Madison Square Garden; he released the resulting DVD in the U.S. in 2009, one year to the day of the first concert. Hot August Night/NYC debuted at No. 2 on the charts. On the same day the DVD was released, CBS aired an edited version, which won the ratings hour with 13 million viewers. The next day, the sales of the DVD surged, prompting Sony to order more copies to meet the high demand. On November 2, 2010, Diamond released the album Dreams, a collection of 14 interpretations of his favorite songs by artists from the rock era. The album also included a new slow-tempo arrangement of his “I’m a Believer”. In December, he performed a track from the album, “Ain’t No Sunshine”, on NBC’s The Sing-Off with Committed and Street Corner Symphony, two a cappella groups featured on the show. The Very Best of Neil Diamond, a compilation CD of Diamond’s 23 studio recordings from the Bang, UNI/MCA, & Columbia catalogs, was released on December 6, 2011, on the Sony Legacy label. The years 2011 and 2012 were marked by several milestones in Diamond’s career. On March 14, 2011, he was inducted into the Rock and Roll Hall of Fame at a ceremony at the Waldorf-Astoria Hotel in New York City. In December, he received a lifetime achievement award from the Kennedy Center at the 2011 Kennedy Center Honors. On August 10, 2012, Diamond received a star on the Hollywood Walk of Fame. In November 2012, he topped the bill at the centenary edition of the Royal Variety Performance in the UK, which was transmittedon December 3. He also appeared in the Macy’s Thanksgiving Day Parade. On April 20, 2013, Diamond made an unannounced appearance at Fenway Park to sing “Sweet Caroline” during the 8th inning. It was the first game at Fenway since the bombings at the Boston Marathon. On July 2, he released the single “Freedom Song (They’ll Never Take Us Down)”, with 100% of the purchase price benefiting One Fund Boston and the Wounded Warrior Project. Sporting a beard, Diamond performed live on the west lawn of the U.S. Capitol as part of A Capitol Fourth, which was broadcast nationally by PBS on July 4, 2013. In January 2014, it was confirmed that Diamond had signed with the Capitol Music Group unit of Universal Music Group, which also owned Diamond’s Uni/MCA catalog. UMG also took over Diamond’s Columbia and Bang catalogues, which meant that all of his recorded output would be consolidated for the first time. On July 8, 2014, Capitol Records announced, via a flyer included with Diamond’s latest greatest hits compilations, All-Time Greatest Hits, which charted at 15 in the Billboard 200, that his next album, Melody Road, which was to be produced by Don Was and Jacknife Lee, would be released on September 30, 2014. In August, the release date was moved to October 21. On July 28, 2018 Diamond and his wife Katie McNeil made a surprise visit to the Incident Command post in Basalt, Colorado – near where Diamond lives – to thank the firefighters and families with a solo acoustic guitar concert for efforts in containing the Lake Christine Fire, which began on July 3 and had scorched 12,000 acres (4,900 ha; 49 km2) of land. In the 2001 comedy film Saving Silverman, the main characters play in a Diamond cover band, and Diamond made an extended cameo appearance as himself. Diamond even wrote and composed a new song, “I Believe in Happy Endings”, for the film. During this period, comedian/actor Will Ferrell did a recurring Diamond impersonation on Saturday Night Live, with Diamond himself appearing alongside Ferrell on Ferrell’s final show in May 2002. In 2008, Diamond gave filmmaker Greg Kohs permission to use his songs in a documentary. Kohs, a director from Philadelphia, had met a popular Milwaukee, Wisconsin, duo, Lightning & Thunder, composed of Mike Sardina, who did a Diamond impersonation, and his wife Claire. Kohs followed them for eight years and produced the film Song Sung Blue, but he needed permission to use Diamond’s songs. The movie was sent to the singer in January 2008 at the recommendation of Eddie Vedder, a supporter of the film and of the duo. Though Sardina had died in 2006, Diamond invited his widow and her family to be his front-row guests at his show in Milwaukee, where he told them he was moved by the film. In the CBS show, The Big Bang Theory, main characters Howard Wolowitz and Amy Farrah-Folwer are fans of Diamond’s work. Diamond has been married three times. In 1963, he married his high-school sweetheart, schoolteacher Jaye Posner. They had two daughters, Marjorie and Elyn. They separated in 1967[ and divorced in 1969. On 5 December 1969, Diamond married production assistant Marcia Murphey. They had two sons, Jesse and Micah. The marriage lasted 25 years, ending in 1994or 1995 (sources differ). In 1996, Diamond began a lengthy, live-in relationship with Australian Rae Farley after the two met in Brisbane, Australia. The songs on Home Before Dark were written and composed during her struggle with chronic back pain. On September 7, 2011, in a message on Twitter, the 70-year-old Diamond announced his engagement to the 41-year-old Katie McNeil. Diamond said that his 2014 album Melody Road was fueled by their relationship, explaining: “There’s no better inspiration or motivation for work than being in love. It’s what you dream of as a creative person. I was able to complete this album – start it, write it and complete it – under the spell of love, and I think it shows somehow.” The couple married in front of family and close friends in Los Angeles in 2012. In addition to serving as Diamond’s manager, McNeil produced the documentary Neil Diamond: Hot August Nights NYC.